Every year, the WGP awards the Otto-Kienzle Commemorative Medal to an excellent junior scientist of manufacturing technology. At this, not only special performance in the scientific area are honoured but also the award winner’s personality. The ceremonial award of the medal takes place within the frame of the WGP Annual Congress. 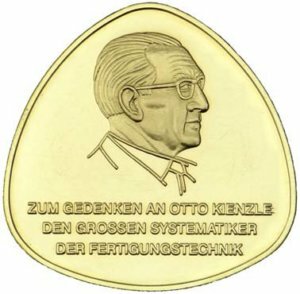 Since 1971, the Otto-Kienzle commemorative medal has been awarded in memory of Prof. Otto Kienzle (1893-1969), a significant engineer, production planner and university teacher, who decisively had a lasting effect on production technology in Germany for more than 40 years. Otto Kienzle was one of the prominent personalities of the “University Group Production Technology”, which was renamed into the current German Academic Association for Production Technology (WGP) in 1987.